Review: 'Bumblebee' Takes Flight Director Travis Knight takes over from Michael Bay, and sets about getting viewers to care about characters instead of assaulting our senses. The result is surprisingly watchable. Charlie (Hailee Steinfeld) and Bumblebee (as himself) are more than meets the eye in Bumblebee. There's really no scientific expression for how low Michael Bay's five previous Transformers movies have set the bar, but it's not enough to praise Bumblebee, the diverting new spin-off/prequel, for basic visual coherence or evidence of identifiable human emotion. It does better than that, imbuing the commercial cynicism of a Hasbro product with the borrowed warmth of E.T. : The Extra Terrestrial, Splash, and a soundtrack so chock-a-block with '80s favorites that it gets from The Smiths to Steve Winwood in a hummingbird's sneeze. Though Bay has stayed on as producer, director Travis Knight, who made the wonderful Laika animated film Kubo and the Two Strings, and his screenwriter, Christina Hodson, almost make a point of crumpling up his vision and tossing in the waste basket. Gone is the Bay's risible mix of mythology and militarism, replaced by simplified conflict and an emphasis on the friendship between an outcast and an exile. Gone also is the leering, dorm-room poster sexuality, replaced by a notably chaste teen romance that doesn't get past first base. Bumblebee seems to have more of a family-friendly mandate than Bay's Transformers movies, but the lightness and earnestness serves the material well. Movies inspired by toys tend to crack like cheap plastic under too much weight. The opening melee on Cybertron, the home planet of the Transformers, has an appealing modesty to it, setting up the story without battering the audience in submission. (Again, the bar is quite low.) The Autobots, led by Optimus Prime (voiced by Peter Cullen), are losing their civil war against the evil Decepticons and beat a hasty retreat, vowing to scatter for now and reunite on the same planet later to gather their forces for another fight. B-127, a diminutive yellow robot, is sent to Earth as a scout, but after a scuffle with a secret military unit, led by Jack Burns (John Cena), it loses consciousness just after transforming itself into junky 1967 Volkswagen Beetle. 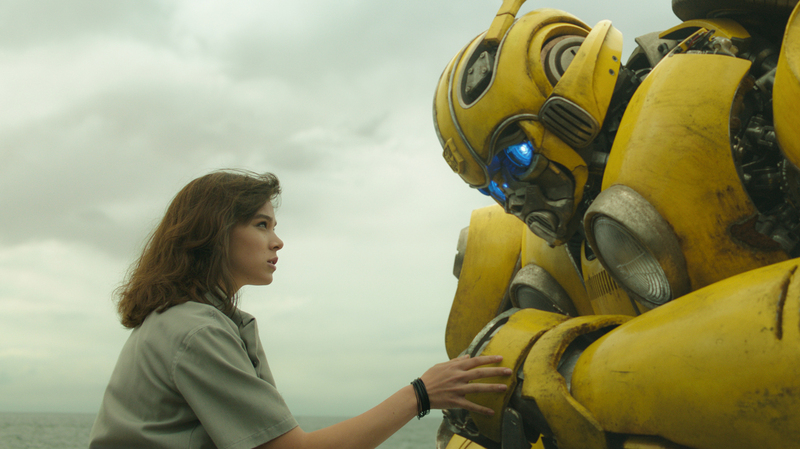 B-127 become Bumblebee when Charlie (Hailee Steinfeld), a tomboy gearhead who loves The Smiths and not much else, takes a liking to the car and nurses it back to health, unleashing the amiable robot inside. As Bumblebee learns to communicate through his radio — shades of Daryl Hannah's mermaid picking up English through a department-store TVs in Splash — two Decepticons infiltrate the local military base, track him down and use satellite technology to summon the troops to defeat the Autobot resistance. It's like E.T., only the bad guys are phoning home. There's an abundance of stock elements to Bumblebee, from a scene where Charlie makes a point of throwing away all her diving trophies (shame that her diving talent should go unexploited) to the missing father at the center of her family conflict. The film, too, is a K-Tel album of '80s needle drops and other bric-a-brac, like scattered cans of Tab soda or Charlie eating a bowl of Mr. T cereal for breakfast. But the cast does its part to redeem these familiar plot points and cultural markers: Steinfeld air-drumming through The Smiths' "Bigmouth Strikes Again" says a lot about a lonely girl who filters the world through her headphones and Pamela Adlon's performance as Charlie's mother carries over nicely from Adlon's TV show Better Things, in which a mother's love is both steadfast and exhausted. As for big man himself, Bumblebee has the gentle, peace-loving quality of the Giant in The Iron Giant, content to play a game of hide-and-seek or go out cruising along the California coastline. He's roused into action reluctantly, and the film seems to share his lack of enthusiasm: Knight stages the obligatory robot throwdowns competently, but they're satisfying mainly because the film cares more about establishing a rooting interest first. The scenes between Charlie and the robot have the deftness of silent comedy — the robot's inability to speak is a major asset — and a bond is created out of companionship and playtime, just like Elliott and E.T. Like B-127 itself, Bumblebee is patched together out of spare parts, with a slavish devotion to '80s suburban science-fiction to rival the referential Netflix hit Stranger Things. A stray note or two of originality seems like a big ask for a Transformers prequel, but in a series that has skipped over the basic ABCs of filmmaking, conventionality feels like a stabilizing force.